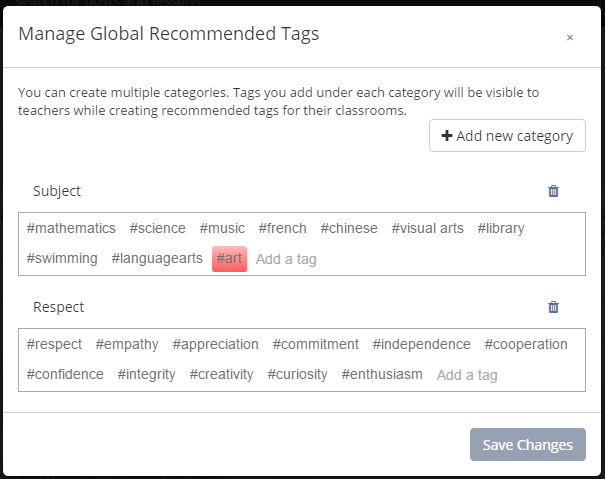 As the name suggests, global recommended tags are the tags that can be used throughout the platform. As an administrator, you can create global recommended tags which will be available across all the classrooms by default. 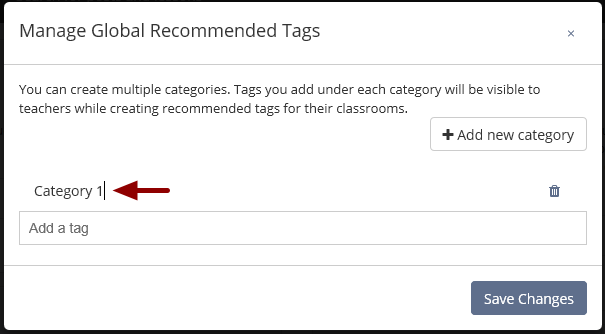 The instructors can easily click and pick the desired recommended tags for their classrooms. The aim is to ensure that different instructors don’t end up using different tags that are meant to be on the same lines. 1. Click the Dash sidebar. 2. 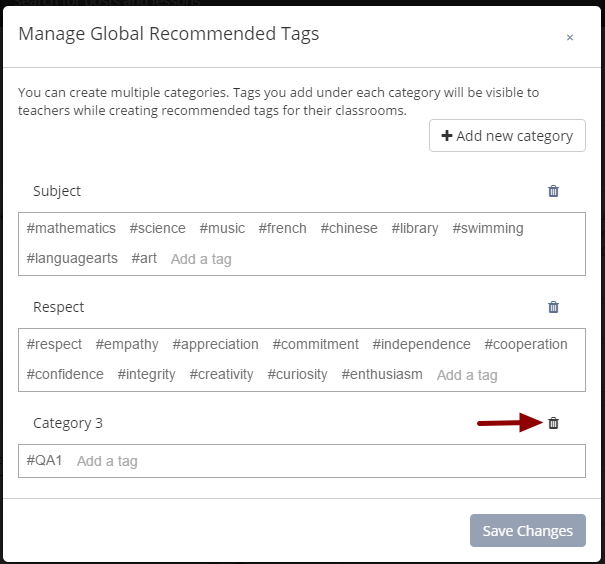 Select Manage Recommended Tags from Manage Teamie section. 3. A Manage Global Recommended Tags pop-up open, you can add multiple categories and add tags in them for the instructors to use. 1. Access global recommended tags section. 2. Click +Add new category. 3. A new category with default name "Category 1" will be created. Click on its title and rename the category as per your wish. 4. Click +Add new category again to create another category. Repeat accordingly to get the required number of categories. Note: Atleast one hashtag needs to be added to a category before you save it. 6. Click Save Changes when you are done with adding categories. Note: Every change that is made inside the Manage Global Recommended Tags section (creation, editing / deletion) gets saved only when the "Save Changes" button is clicked. 2. 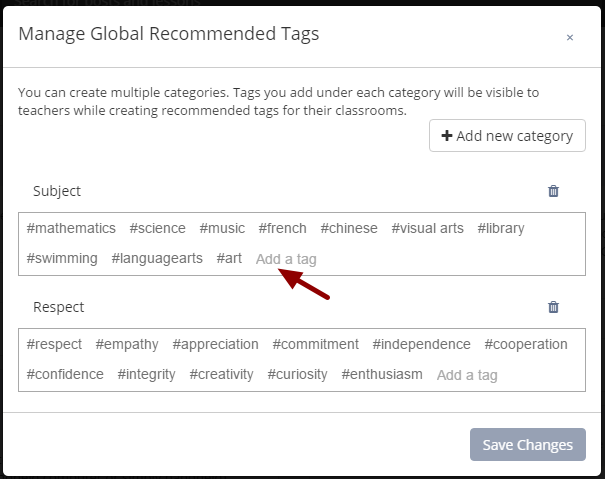 Click the input field of the category in which you wish to add the global recommended tags. 3. 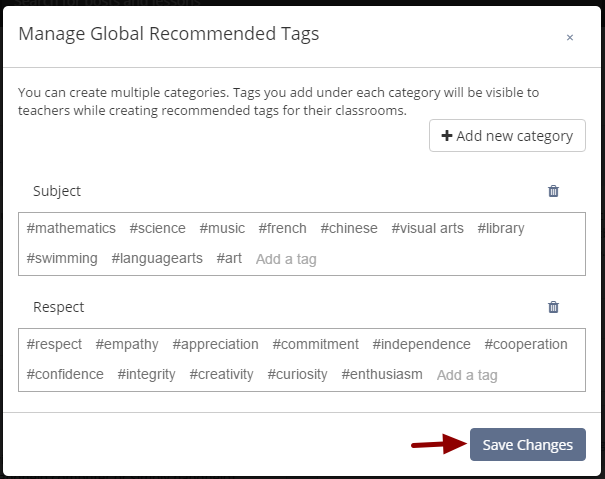 Type out the tag and press enter or click anywhere in the Manage Global Recommended Tags pop-up. 4. 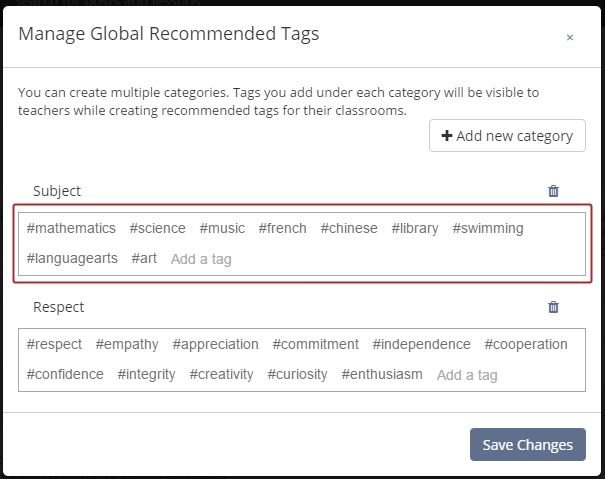 Similarly you can add multiple tags in various categories. 5. Click Save Changes to save the changes. Note: Every change that you make inside the popup (creation, editing / deletion) gets saved only if you click the "Save Changes" button. 2. 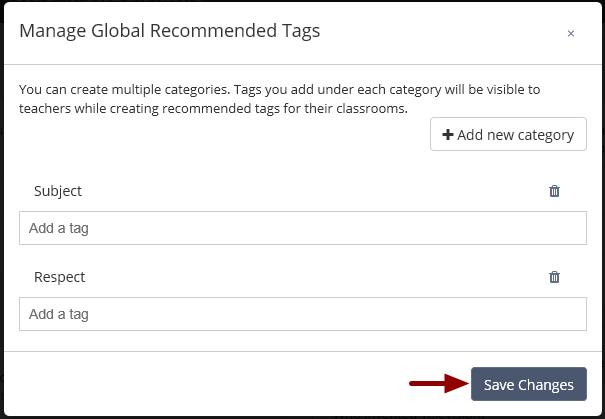 Click after the last tag in the input field of a category in which you wish to delete global recommended tag(s). 3. 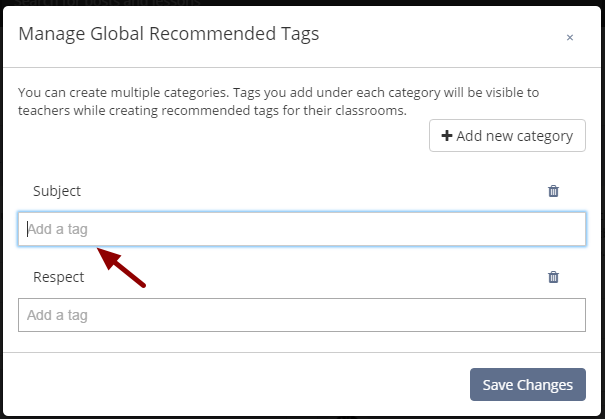 Press the left arrow key/backspace on the keyboard to select the last tag of the category. 4. Navigate to the required tag by using the left or right arrow key. 5. Press backspace button on the keyboard to remove the tag. 6. Do not forget to save the changes by clicking Save Changes. 2. Click the trash icon in front of the category to delete it. 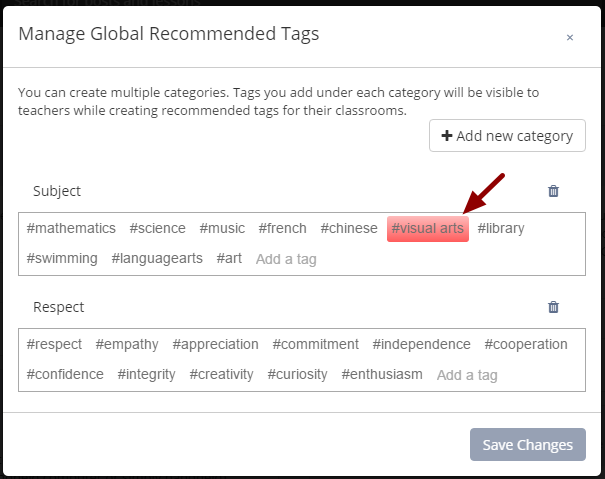 Note: If you delete a category, you will lose all the tags you have added under that category. 3. A confirmation message appears. Click Yes, Delete if you are sure that you wish to permanently delete the category. 4. The required category will be deleted only after you click the Save Changes button.